R122, the primary autolysis site of the human cationic trypsinogen (PRSS1), constitutes an important "self-destruct" or "fail-safe" defensive mechanism against premature trypsin activation within the pancreas. Disruption of this site by a missense mutation, R122H, was found to cause hereditary pancreatitis. In addition to a c.365G>A (CG C>CA C) single nucleotide substitution, a c.365~366GC>AT (CGC>CAT) gene conversion event in exon 3 of PRSS1 was also found to result in a R122H mutation. This imposes a serious concern on the genotyping of pancreatitis by a widely used polymerase chain reaction-restriction fragment length polymorphism assay, which could only detect the commonest c.365G>A variant. 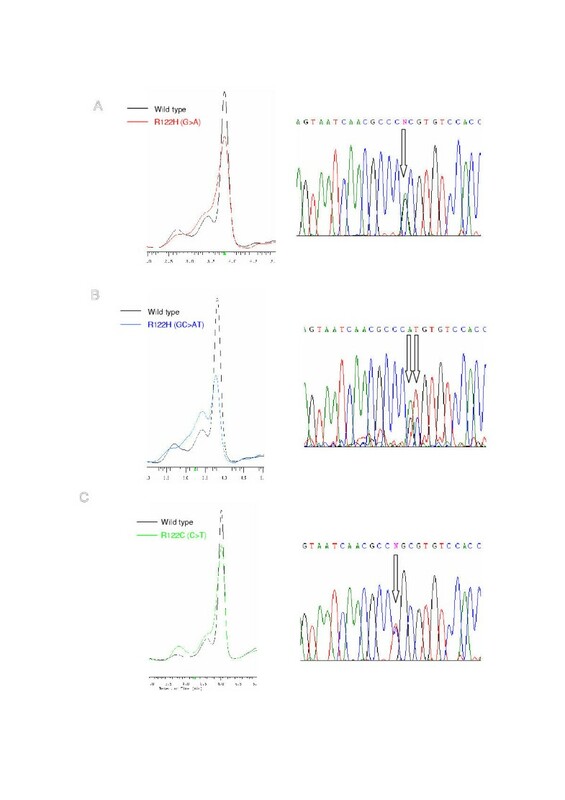 DNA samples containing either the known c.365G>A or c.365~366GC>AT variant in exon 3 of PRSS1 were used as positive controls to establish a denaturing high performance liquid chromatography (DHPLC) assay. DHPLC could readily discriminate the two known different mutational events resulting in the R122H mutation. More importantly, under the same experimental conditions, it identified a further mutational event that also occurs in the R122 primary autolysis site but results in a different amino acid substitution: c.364C>T (C GC>T GC; R122C). A rapid, simple, and low-cost assay for detecting both the known and new mutations occuring in the R122 primary autolysis site of PRSS1 was established. In addition, the newly found R122C variant represents a likely pancreatitis-predisposing mutation. Trypsin plays a central role in pancreatic exocrine physiology by acting as the trigger enzyme that leads to the activation of all the digestive proenzymes. To prevent premature trypsin activation within the pancreas, the body has evolved a series of defensive mechanisms. Of particular significance is the "built-in" R122 primary autolysis site of mammalian trypsinogens, which serves as a "self-destruct" or "fail-safe" mechanism to prevent pancreatic autodigestion . Disruption of this site by a missense mutation – R122H (originally termed R117H in the chymotrypsin numbering system ; for a discussion of mutation nomenclature see [3, 4]) – in the human cationic trypsinogen (PRSS1; OMIM 276000) has been associated with most of the large kindreds with hereditary pancreatitis (HP; OMIM 167800) . The initially identified R122H mutation results from a c.365G>A (CG C>CA C) transition in exon 3 of PRSS1. Since this mutation creates a novel restriction recognition site for Alf III (A↓CRYGT), a polymerase chain reaction-restriction fragment length polymorphism (PCR-RFLP) assay was established  and has been widely apdopted to detect this most frequent mutation in both hereditary and sporadic cases of pancreatitis [summarized in ]. However, this simple assay fails to detect a c.365~366GC>AT (CGC>CAT) gene conversion event that also results in a R122H mutation . The latter was first identified in a sporadic chronic pancreatitis subject by denaturing gradient gel electrophoresis (DGGE)  and confirmed in a HP family by direct sequencing . Here we undertook to establish a new technique – denaturing high-performance liquid chromatography (DHPLC) – for accurately genotyping the two different mutational events resulting in the R122H mutation. Moreover, we identified a further mutational event that appears also to disrupt the R122 primary autolysis site of PRSS1. For genotyping known genetic variants, PCR-RFLP, if available, represents the most simple and rapid method. However, it has an intrinsic disadvantage, that is, it could only detect a "specific" variant, exemplified by the PCR-RFLP analysis of the c.365G>A (CG C>CA C; R122H) variant in PRSS1. DGGE is one of the most powerful techniques for mutation detection and screening but, unfortunately, it is time-consuming and technically difficult to implement . DHPLC is an automated technology for mutation screening based on the separation of heteroduplexes from homoduplexes on a stationary phase under partialy denaturing conditions . This technique was initially used for identifying single nucleotide polymorphisms on the Y chromosome  and, thereafter, has been emerging as a sensitive, rapid, low-cost, and reliable method for mutation detection and screening in different genes, including the cystic fibrosis transmembrane conductance regulator gene , the hereditary hemochromatosis gene , and the BRCA1 and BRCA2 genes . In this report, DHPLC was attempted to screen the two known mutational events in exon 3 of PRSS1 that result in the most frequent pancreatitis-associated R122H mutation. As shown in Fig 1, this technique could readily discriminate the two different mutational events in all of our positive control samples. Moreover, it identified new c.365G>A (CG C>CA C; R122H) carriers in our cohort of chronic pancreatitis subjects (data not shown). Further, it found a novel autolysis site mutation: a c.364C>T (C GC>T GC) transition, which is presumed to result in a R122C amino acid change of the human cationic trypsinogen (Fig. 1), was detected in a 42 years old women with idiopathic chronic pancreatitis. This new variant was not present in 300 French healthy blood donors evaluated by DHPLC. To date, this c.364C>T (C GC>T GC) variant and the c.365~366GC>AT (CGC>CAT) variant have only been detected once each in our cohort of about 400 French patients with chronic pancreatitis. Detection of three mutational events in exon 3 of PRSS1 resulting in a disruption of the R122 primary autolysis site of human cationic trypsinogen. Left panel: denaturing high performance liquid chromatography (DHPLC) profile of the mutant compared with the wild type sequence. Right panel: direct DNA sequencing of independently amplified polymerase chain reaction products. Mutations are indicated by arrows. A: c.365G>A(CGC>CAC; R122H); B: c.365~366GC>AT (CGC>CAT; R122H); C: c.364C>T (CGC>TGC; R122C). Refer to Table 1 for a summary of these mutational events. Here it might be interersting to note that while the c.365G>A (CG C>CA C; R122H) could be attributable to a spontaneous deamination of 5-methylcytosine to give thymine in the CpG island on the antisense strand, the c.364C>T (C GC>T GC; R122C) could be attributable to such an event on the sense strand. Thus the R122 primary autolysis site seems to be particularly susceptible to mutational events (CpG island and gene conversion-promoting structure) despite of a strong selection pressure (Table 1). Nevertheless, the nature of the R122C variant suggests that it is a likely pancreatitis-predisposing mutation: an arginine to cysteine substitution is expected to disrupt the R122 primary autolysis site simply because cysteine could not be cleaved by trypsin, as in the case of the R122H mutation. However, the resistance to autolysis confered by the R122C mutation may be somehow different from that confered by the R122H mutation in a quantitative manner. In parallel functional analysis of the R122H and R122C mutations would certainly help determine genotype/phenotype correlation. This study, for the first time, established a new technique – DHPLC – for genotying the different mutational events occuring in the R122 primary autolysis site of PRSS1. Importantly, this technique could not only discriminate the two known mutational events, but also identified a further mutational event that occurs in the R122 primary autolysis site of PRSS1. Thus this assay avoids the pitfall of the existing PCR-RFLP method. Moreover, it is more easily performed compared with the DGGE technique. Finally, the newly found R122C variant represents a likely pancreatitis-predisposing mutation. DNA was isolated from blood cells by salt precipitation method from chronic pancratitis subjects. DNA samples with the known c.365G>A (CGC>CAC; R122H) or c.365~366GC>AT (CGC>CAT; R122H) mutations in exon 3 of PRSS1 were used as positive controls. Primers' sequences used for PCR amplification of exon 3 of PRSS1 were TCCATgAgCAgAgAgCTTgAggAA (sense) and TgTgAggATggAgggAAgTAgAAggACT (antisense). PCR was performed in 50 μ l reaction volume using ampliTaq DNA Polymerase (Perkin Elmer). Particularly, Touchdown PCR protocol  was used and cycling conditions were as follows: denaturation step at 94°C for 3 min; 14 touchdown cycles with decreasing 0,5°C annealing temperature per cycle from 70 to 63°C (denaturation 94°C for 20 sec, annealing for 40 sec, primer extension 72°C for 45 sec); 25 cycles at 63 °C annealing temperature, final elongation step at 72°C for 7 min; heteroduplexes formation by denaturing at 95°C and cooling by 1°C step per minute through 65°C in 30 minutes. All reactions were carried out using GeneAmp®PCR system 9700 (Perkin Elmer). DHPLC was performed using the Transgenomic WAVE® system as described by Kuklin et al.. 5 μl of crude PCR samples were loaded to a preheated C18 reverse-phase column based on non-porous poly(styrene-divinyl benzene) particles (DNASep column Transgenomic™). DNA (homo +/- heteroduplexes) was eluted from the column by a linear acetonitrile gradient in 0,1 mM Triethylamine acetate buffer (TEAA) (Transgenomic), pH 7 at a constant flow rate of 0,9 ml/mn. Gradient was formed by mixing buffer A (0,1 mM TEAA) and buffer B (0,1 mM TEAA, 25% acetonitrile). Analysis gradient lasted 2,5 mn with buffer B increasing from 55 to 60%. Then the column was cleaned by 100 % buffer B for 0,5 minute and equilibrated with start condition for 2 minutes before next injection. Elution of DNA was detected by 260 nm UV absorbance. The temperature of the oven was fixed to 64°C after evaluation with software melting simulation (Wavemaker 4.1). HSM® software regulated every parameter of Wave® system during analysis and stored data. Direct DNA sequencing was performed using the ABI PRISM™ BigDye™ Terminator Cycle Sequencing Kit (PE Applied Biosystems, Foster City, CA) with the same PCR primers on an ABI 310 sequencer. This work was supported by the INSERM and the Projet Hôspitalier de Recherche Clinique (PHRC).